This morning was a very rainy blustery affair, but it was also our bi-weekly Link4Coffee meeting on the New Watford Market. Although there was multitude of different conversations I want to draw your attention to just one of them which was prompted by a question. Why is is that you don't get the full depth of what Link4Growth is all about from the website? Now, first let me explain how this question came to be asked. I met up with Francis (from The Dojo in Watford) on Wednesday at a Link4Coffee this past week. It wasn't the first time I'd met Francis, actually we had met at a Link4Coffee some 2 years previous. So why two years? ... Well maybe although the Link4Growth message may have been more or less the same for whatever reason, perhaps the timing was not right. 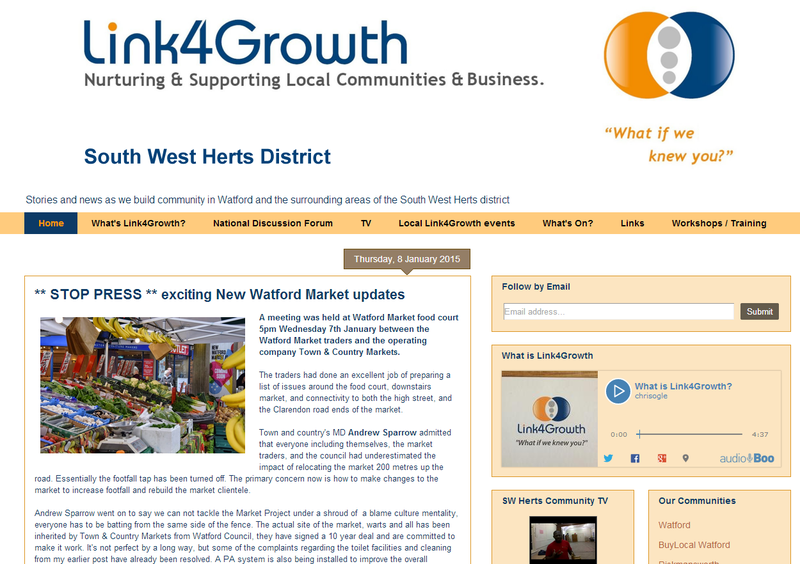 Now Link4Growth has moved on in two years and what is happening in Watford has expanded somewhat with 14 or so events now be hosted each week. But additionally we now have the SW Herts District website and also community TV where we are building up a whole catalogue of TV clips (YouTube videos) about what is going on in SW Herts. You can take a look at the channel here... We are grouping the videos into Playlists to simplify sharing the good news! The answer is of course because how can you possibly express the experience of being part of your local community, really belonging... and making a difference, on a website? It's a challenge and no mistake. So what did the experience of sitting there and talking with Neal and myself reveal to Francis that until this point he had not been able to pick up? We all have probably experienced belonging to a community. Our class / year at school was / is a community, local football club, group of people who meet regularly for a drink or any other situation where we hook up at a place to take part in something which those participating enjoy. In these communities we are amongst friends, people with common purpose, we know each other, we respect others, we have respect, we actively engage and play our part, we have self worth as part of this group. In short we belong. To easily understand this think back to when you were at school and a new person joined the class. 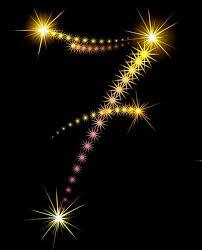 Some excitement of course to meet this new person, but, they're an unknown quantity, how will they fit in? What is their skill set? Who will they make friends with? Can they be trusted? ... It takes time to belong. What Francis witnessed is how Link4Growth and the people in it, are integrating into the community. Personally I now know most of the people on the Watford Market but this has taken over a year developing this to be accepted. It is a good experience (and feeling) to go there on a Saturday and say hi to everyone, in short I now belong, even though I am not myself a trader. The speed of Link4Growth expansion in Watford will now accelerate as more people begin to see how it connects people, rebuilds community and thereby positively impacts people's lives... When we work together like this it is amazing the energy and speed at which this can happen. 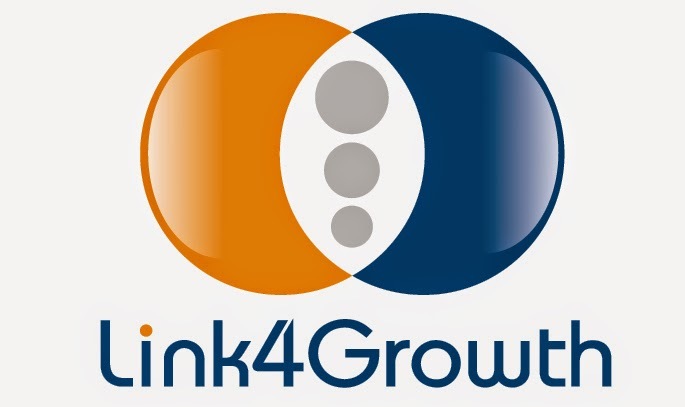 During the discussion (and on many occasions) the values of Link4Growth emerged one by way as confirmation of the thinking and the way forward. Openness, fact based decision making, personal growth, we not I thinking. Of course underpinned by principles such as everyone is important, everyone is equal, everyone should be respected, everyone should be able to have a voice and be heard... And that we should not be judgemental as everyone is on their own unique journey with their own story. What happened this Saturday morning was an experience. It is fine to know the theory, but when you see that theory in action... It makes all the difference. This was a pure demonstration (not contrived) of how Link4Growth is making a difference actually in the community... live... not words... action. Neal is opening a coffee shop, why? Because he is passionate about getting people to think for themselves, to question what is happening around them, and indeed why they behave the way they do. 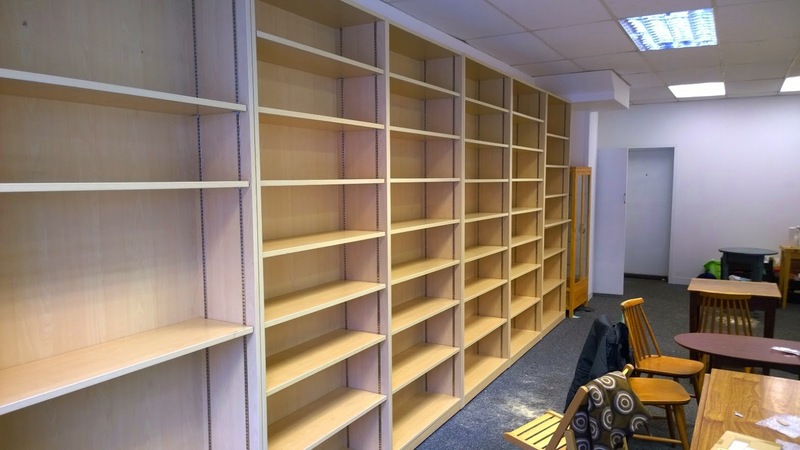 Neil is taking action creating a space on the high street to facilitate delivering something he believes is important and needed in the community and the good news is... This will undoubtedly become a hub for self improvement where people from all ages can come together and develop, every town will want one!! 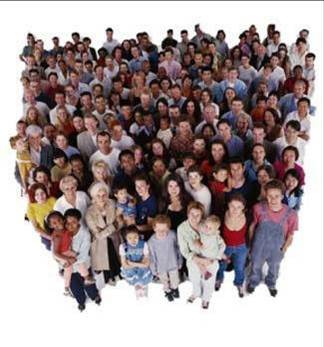 We can all participate, as the community is vast and the possibilities for our own contribution immense. So in summary... Francis went from a light touch two years ago to now recognising that his own project is fundamentally part and parcel of the local community, it always was by the way. This recognition though has meant the journey can progress. Link4Growth is a discovery in the same way personal development is. You can't learn all there is at the first touch. I know I wanted to know everything about personal development immediately when I started my journey, but the old proverb of 'when the student is ready, the teacher will appear' has never failed yet. 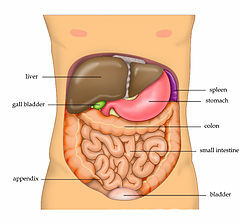 Link4Growth is a bit like that, you peel back the layers of understanding as your inquisitiveness increases. Upon revisiting Francis witnessed that the Link4Growth organisation was not only still here but expanding rapidly and that the message was in alignment with his own thinking. 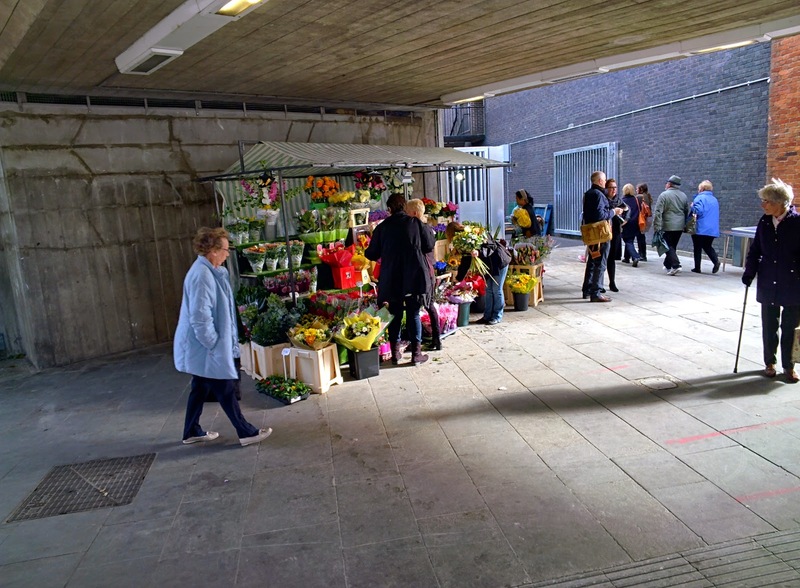 The Saturday visit to the Market was validation and confirmation that Link4Growth not only talks the walk, it walks the walk and is actually delivering changes in the community that are needed. By uniting people who are doing good work in our communities, leveraging of our combined connections, and being organised in a simple but effective framework (Link4Growth) we can enable everyone to play their part if they want to. Applying this process nationally (... and internationally, why not?) we can build huge momentum and create the changes necessary to create a much fairer world. The book on Link4Growth can be found below for Kindle & Paperback... Let's go create a fairer more equitable world, the time to start is now... pick up a copy and start rebuilding where you are!